This was my last work out at the Traverse City, MI Anytime Fitness. It’s hard to build up the shoulders…at least to have them have a nice rounded look. So here is some of what I do on a weekly basis. Try the work out and let me know what you think! I don’t want to make light of the pressure that it takes to make a dream come true! I’m in the hunt! I have been for a while! It seems that I take so many steps forward and then a few backward and keep switching feet in the process!! The pressure is on…in more ways than one!! My car and Jim’s truck are unreliable at best!! We need to get there!! The WBFF cost more to be involved in! It’s a much much better show…very entertaining for the crowd. And, we have to pay for that!! I need to put together my costume! I need new suits…my competition suit won’t work! Oh….but it will all be soooo worth it! The bottom line is, God’s got this!! That’s right! He really does have a funny way of working out details…it’s our jobs to live and stand in faith as we continue to do what is right! I haven’t stopped working out! I am still on the eating plan and have added LOADS to my work out routine to bring my legs tight!! I’ve lifted, hill sprinted, squatted, lunged, plio jumped, and weighted step-uped until I’ve cried!! NO really! My legs are taking a beating right now!! Well, legs and glutes!! I’ve been missing the stage, but Jim has been adimate that I need the time to build, recoup and prepare for Toronto!! I know he’s right…and I’m listening….but there in lies that hard part! Keeping the faith, while you can’t see the results!! And, as my favorite little movie “friend” Dori likes to say…. “Just keep swimming, just keep swimming…swimming swimming swimming! !” I HAVE to keep moving forward!! I am almost there!! I am soooo very close!! You all have encouraged and cheered me on so darn much!! How can I just stop now? I don’t feel like it today….Get off that couch and go do your work out…no short cuts!! But I’m crying….one more rep Missy!! Doubt and fear set in…reach out and get back on track!! Why am I doing this again?? …look back and remember about inspiring others to follow their dreams!! To get up…Get active…Get fit!!! All of this leads me to the 2nd Dream that I’m after…Our National Fitness Tour! Red Fox Fitness has a purpose!! To show how you can have a Healthy, Active Vibrant lives through living Healthy and Fit out daily in the High 5 areas! To find companies that compliment all High 5 areas of fitness and tell all of you about them!! To do this for ourselves, and our families and friends! I remember and know first hand what it’s like to let myself go. To be overweight and lethargic in my own life and to look in the mirror wondering who it was looking back at me! It doesn’t have to be that way!! Not in the slightest!! It’s very possible to have the life of your dreams – Whatever that may be! So, here’s my Stats with 7 weeks to go! Some of my measurements have gone up…but my weight has stayed the same…which means…I have lots more muscle!! I’ve worked really hard on this! Especially in my lower body! My Hamstrings were MIA…not any more! My glutes were there…but not as High and Tight as they could be!! They are better! I will try to post weekly to show the progression and talk about what’s happening along this part of the journey! I want to thank you for all your AWESOME encouragement and pressing me onward!! We are definitely dong this together!! The Red Fox Fitness TEAM!! 7 weeks out from Worlds!!! WBFF Here I come! REd Fox 2 – Ready or not…I’m going to Worlds!! This Dog will play catch for hours!! Fitness for fun…for confidence…for life! There’s comes a point when you’ve just got to say “ENOUGH” I don’t know when and where and what that will be for you, but I DO know what you’l get when you make that decision. Depending on where you are when you start your journey, it may mean you have a way to go, or maybe you just need to firm up and get some energy again, but it’s not a diet or a moment or even a destination really. It’s a lifestyle! When you do achieve this, one of the great side benefits is that even though you started out not “feeling it” or wanting to, the fun does come! It does become something that is enjoyable! I think this is true because of how utterly great you feel when you start to achieve some results!! I’ve seen it time and again, sticking with it and hitting some mile-stones and how the excitement starts to build! Belief that it’s possible to get the results that you are desiring…it’s so exciting!! I know that it is possible and when you have the fitness and energy again (or maybe for the first time)…confidence comes too! It’s a side benefit of achievement. This is true in many areas of setting a goal…any goal and achieving it. No matter how many times you fall off or come across a set-back, get right back at it and keep moving forward! Just keep at it and you WILL get there!! I like exercises that give you the most work out for your movements!! I do use others that target a particular area, but for the most part…I’m in the gym enough and always find ways to get the most out of each set/rep/exercise that I do!! LOVE the Standing Dumbell Curls. This works the core right along with my bi-cepts!! That’s working it smart!! 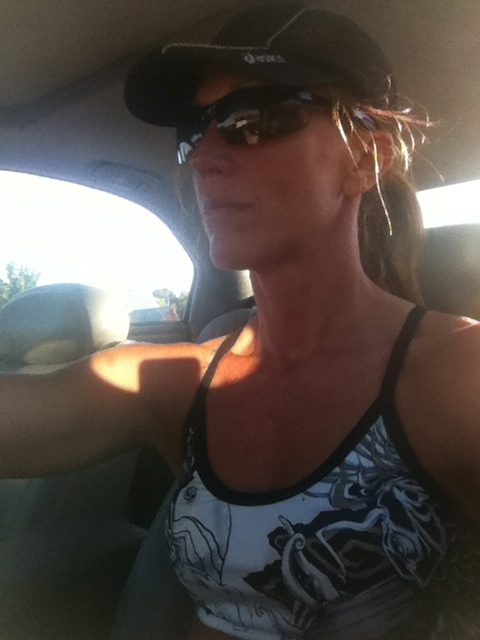 Pamela “Red Fox” Smith 2nd place…Go after your goals and inspire yourself and others in the process. God wants us to be stretched! This is where we find His strength! Here’s my weekly ck in…Two weeks out from next Competition! Red Fox Preacher Curls…Pamela is doing 70#!! Here’s my weekly update for ya!! Hams and Glutes Work out!